Do you like a little healthy competition? 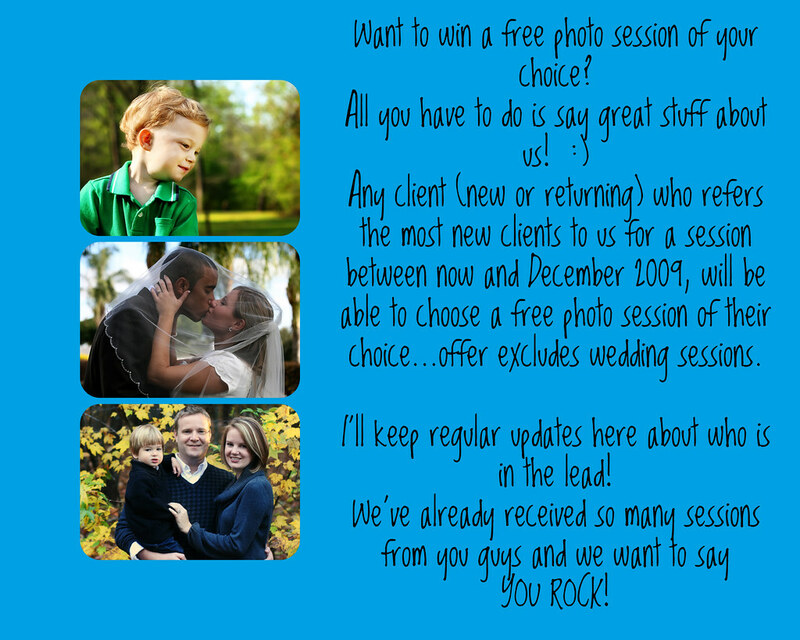 It can definitely be fun...and we like fun and we LOVE new clients that come from clients that have already had sessions with us...the two biggest compliments are when clients come back for more photos and when they send their friends and family to you because they enjoy what you do and how you treat them! If you are a client who made it to us but are not listed on here and want us to add the person who referred you, just let me know and we'll include those as well. Natalie has referred Missy, The Wood Family...and there's one pending. Sarah sent over her Mom. So...there's a three way tie going on right now between Lennye, April and Natalie unless the one that's pending for Nat becomes an actual client and then she'll be in the lead! Lennye if Erin D. is coming to us because of a referral from you, let me know and that will count for you as well.